It's Valentine's week and we are spreading extra love thanks to your inspiring ideas! During our Kindness Challenge, you all have submitted so many amazing examples of simple acts of kindness, and we hope by thinking of these ideas, that it makes you want to really help others. We are going to be enacting some of your ideas in real life! We went to Gateway Mall at a busy time over the weekend to place these dollars on the vending machine and got to witness a couple's surprise upon finding them! MORE COMING THIS WEEK! 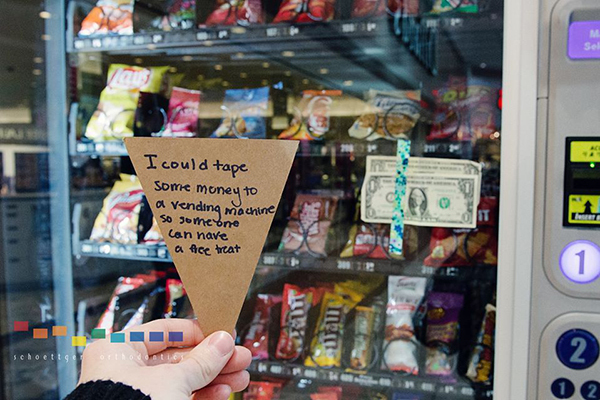 Thank you for this vending machine idea, Tatumn!